The eight-year-old son of Germany jumped with aplomb throughout the two-mile contest and produced a superb leap at the last to seal a bloodless 10-length victory over the Philip Kirby-trained Lady Buttons, the 5/1 favourite. De Bromhead said: "Moon Over Germany had a couple of nice runs at home but, to be honest, he had been disappointing. I think, like a lot of ours, he has just struggled on better ground but has encountered soft ground today. He was obviously off a good mark because of it! "We loaded the horses hoping that we would get a bit of ease in the ground, so it's fantastic to get it, and it's great for Philip and Anne Reynolds. "I am delighted for Rachael. We are very lucky to be associated with her and very lucky to have her riding most of our horses. 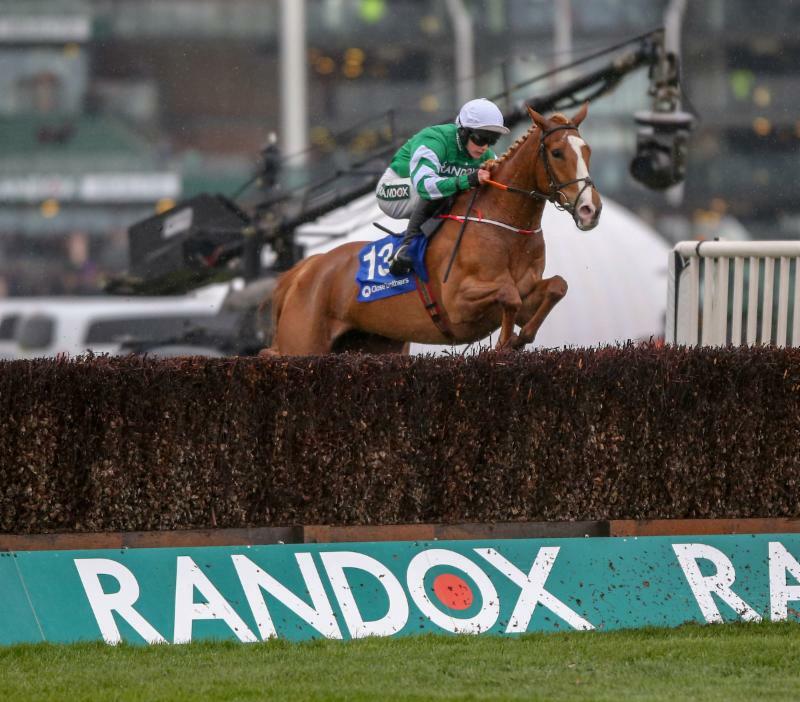 "Hopefully, he could head to Punchestown and we will see. We enjoy today anyhow and it's fantastic to get back here." Rachael Blackmore scored her first Randox Health Grand National Festival success when 11/2 chance Moon Over Germany, trained by Henry de Bromhead, won the G3 Close Brothers Red Rum Handicap Chase comfortably by 10 lengths from 5/4 favourite Lady Buttons. Blackmore said: "He was very impressive. He galloped and jumped and made it very easy for me. It's fantastic for [owner] Philip Reynolds and his family, and it's fantastic for me to get one here. "The rain definitely helped his chances a little bit, I think. Some of his form on better ground hasn't been great, so maybe the rain today was the deciding factor. He travelled and he jumped, and over that kind of trip [two miles], that's what it's all about." Asked about her Randox Health Grand National ride, Valseur Lido, Blackmore replied: "I'm really looking forward to him. It's a race where if you aren't in it, you can't win, so I'm looking forward to it. "Keith Donoghue said he got a great spin off him last year and he's carrying less weight this year [10st 6lb, whereas he carried 10st 13lb when finishing eighth in 2018 under Donoghue], so you never know." Lady Buttons, sent off the 5/1 favourite in the Close Brothers Red Rum Handicap, found one to good in Moon Over Germany (11/2), who came home 10 lengths to the good. Jockey Thomas Dowson, reported: "She travelled and jumped great but has just bumped into a better, younger horse. "She ran off a mark off 149 and ran really well. She was fourth at the Festival and she has won four before that. I don't know where she will go now but she has run well all season." Jonjo O'Neil, trainer of the third, 14/1 chance Champagne At Tara, commented: "He ran a great race. I thought the ground would be too soft but he handled it OK. He is in the handicapper's grip unfortunately - that is his limit. The handicapper has got it right unfortunately for the horse!" The Patrick Kelly-trained Mall Dini has been ruled out of the £1-million Randox Health Grand National after picking up a leg injury. Owner Philip Reynolds, speaking after Moon Over Germany's victory in the G3 Close Brothers Red Rum Handicap Chase, said: "Mall Dini has a leg injury and will not run at Aintree on Saturday." Just A Par (10st 2lb), trained by James Moffatt, is the first reserve and will now take his place in the line-up.